The progress a baby makes in the first year of life is amazing: a newborn can only wave its arms and legs about randomly, but not so long after the baby can reach out and pick up a crumb from the carpet. What happens in the nervous system that enables this change from random waving to finely coordinated movement? Scientists from the Max Planck Institute of Neurobiology in Martinsried near Munich, working with colleagues from New York and Philadelphia, have described a new type of nerve cell in mice which provides a valuable insight into this developmental phenomenon. 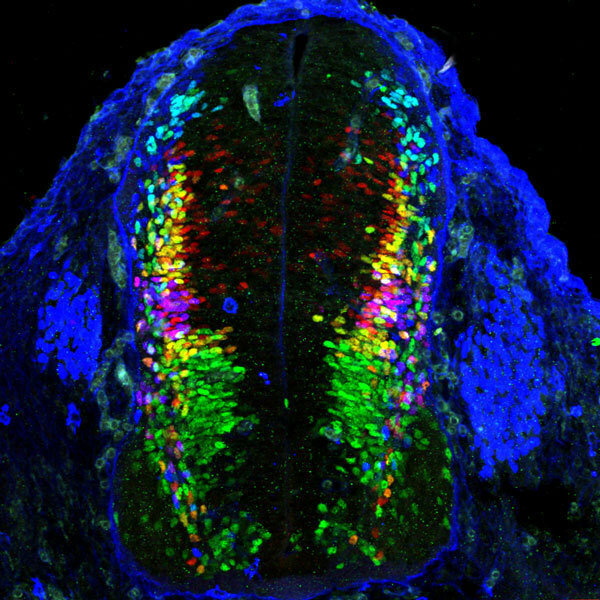 During embryonic development, the projections from these cells grow from the spinal cord towards the brain. They may pave the way for other nerve cells which control voluntary movement and which only grow from the brain into the spinal cord after birth. When we reach out towards an object with our hand or push our foot into a boot, our movements are coordinated and controlled by the brain. For this to be possible there must be a neural pathway for the brain to transmit instructions, for example to the foot; and also in the reverse direction, for stimuli from the surroundings of the foot to be passed back to the brain. Such neural pathways are formed when the projections (axons) grow out from nerve cells during development. Depending on the organism and the body part to be connected, the axons can grow to many centimetres in length. Rüdiger Klein and his team at the Max Planck Institute of Neurobiology investigate how the axons navigate through the body, and which molecules play a part in their pathfinding. In particular, the scientists have been focusing on the signalling molecules known as ephrins and their binding partners, the Eph receptors. Ephrins and Eph receptors are located on the surface of nerve cells, among other places, and help the growing cells find their way and locate their partner cells. Subsequent research by the neurobiologists uncovered something surprising: in contrast with the known cells, the ascending axons of the new cell type did not grow only after birth, but instead already during embryonic development. Moreover, their growth was guided by the same ephrin/Eph signalling system as that involved in the growth of the descending axons. “It would seem that during embryonic development the ascending axons would ‘pre-drill’ a channel for the descending axons which do not grow out until after birth”, explains Rüdiger Klein. 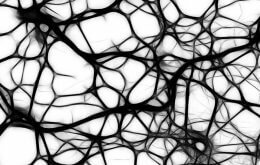 Further investigations into the new, ascending nerve cells have made it clear that they obtain their input from specialised, touch-sensitive cells. A new feedback system could thus be involved here: voluntary movements are refined by signals from touch-sensitive cells, so adapting the intended movement to the environment and your foot slips into the boot. “What we found surprising is the fact that one and the same guidance system directs both the descending and the ascending axons”, says Klein. “This is a wonderful example of how a highly complex nervous system can be built up by making flexible use of individual molecules, and thus a small number of genes.” The next job for the scientists is to find out whether the suspected feedback system actually exists, i.e. whether the ascending and descending cells are connected via synapses. Their aim is to unravel step by step the developmental processes which enable the brain to coordinate sequences of movements.